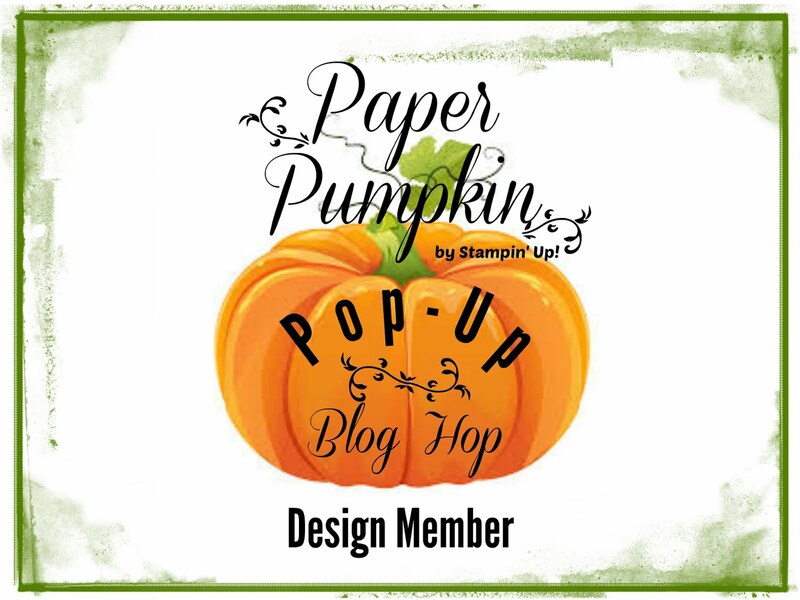 I am so excited about our new Monthly Blog Hop! This is our first hop together and we decided to keep the number of blogs to 12. Not only is that easier for us handle as administrators (I am one), we also wanted to keep the loop small so that you wouldn’t feel rushed to click through them all. We hope you enjoy our projects and we would love to read your comments on our projects and/or on our 12 hoppers format. 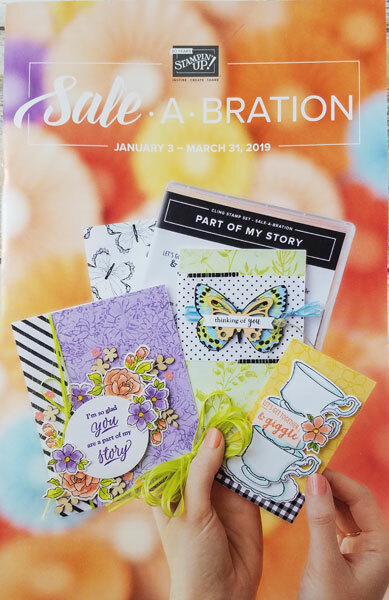 There are so many wonderful products in the upcoming Holiday Catalog that I couldn’t decide which one to focus on. Instead I decided to feature one basic card design showcasing some of the new Designer Series papers (DSP). I hope you enjoy my four cards. Each follows the same basic design, but the different DSP’s gives each one a unique feel. This is the most beautiful DSP! I used two of the four designs. There are three sheets of each and they are single-sided – which is perfect! When you see them in person you will see why there is no way you would ever use what every might have been on the other side anyway! This paper is thicker than normal DSP and would make great gift boxes or bags! This card also used our Gold Foil Paper (to mat the new DSP & sentiment oval), Thick Whisper White card stock, Layering Ovals & Stitched Shapes Framelits, 1/8” Gold Ribbon and the NEW Snowflake Sentiments stamp set. I love the homey feeling of this pack of DSP. 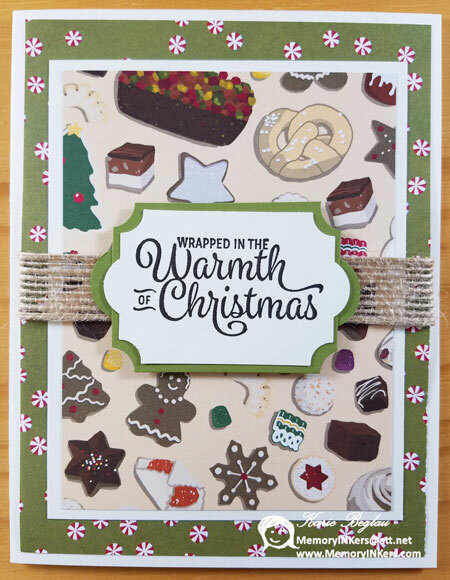 Because of that I decided to use the Burlap Ribbon and the sentiment, also from the NEW Snowflake Sentiments stamp set, fit perfectly with it! 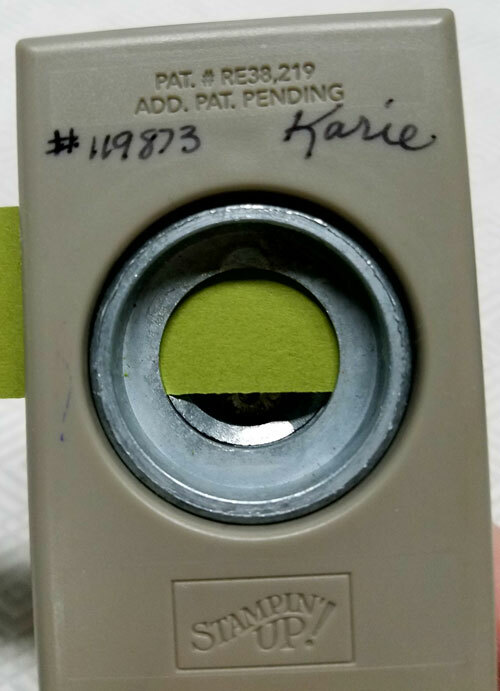 The base is Thick Whisper White card stock and below you can see how I used Old Olive card stock to mat the NEW Everyday Label Punch (I LOVE THIS PUNCH!). 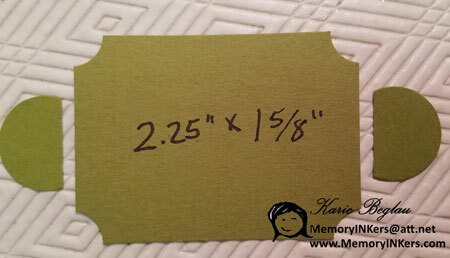 I cut a piece of Old Olive card stock to 2.25” x 1 5/8” and, using the ½” Circle Punch I nipped a curve out of each corner. 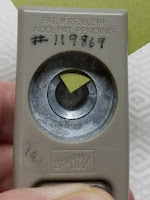 Then, using the ¾” Circle Punch I punched out a particle circle. 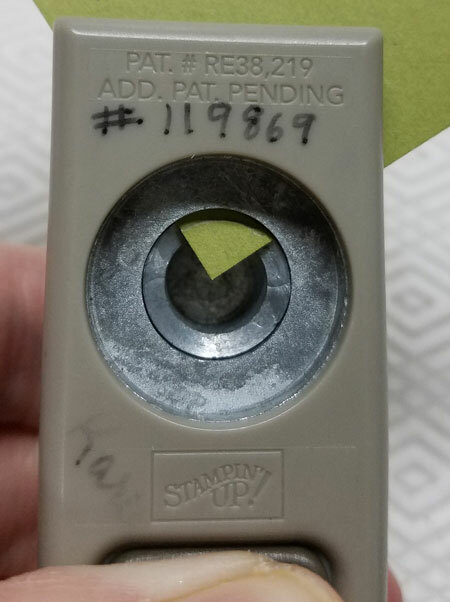 Attach the rectangle piece of Old Olive to the punched-out sentiment (in Whisper White) then add the partial ¾” circles behind that. I love when I can mat a punch with other punches! It might seem odd to use black and white for a holiday card, but I think it can be elegant. 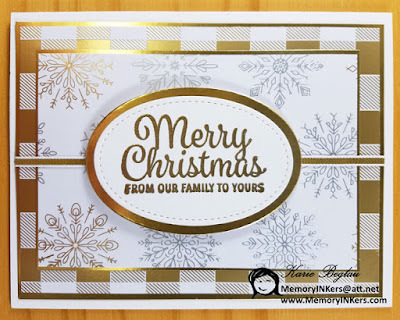 For this card I covered the front of the Thick Whisper White card base with Silver Foil Paper and added three layers of DSP. 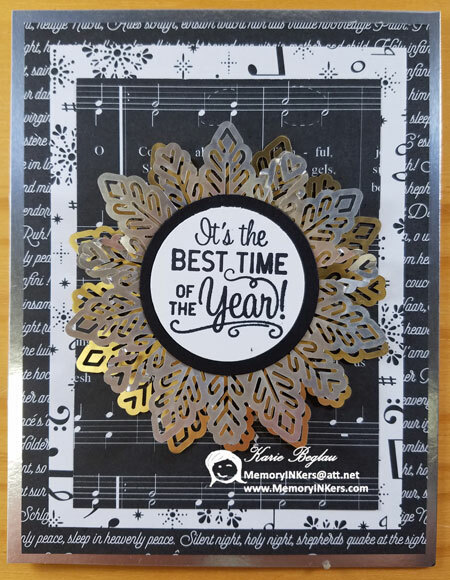 I used the NEW Foil Snowflakes in the center. First a gold one, then trimmed one small section from a silver one and carefully pulled it together to make the circle ‘cup’ a little. 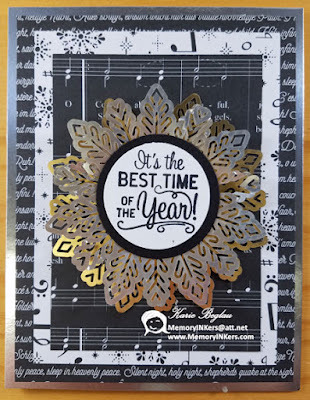 The sentiment is from the NEW Christmas in the Making stamp set and was punched out using the 1 1/2” Circle Punch mated with a 1 ¾” Circle punched from Basic Black card stock. When I saw the awesome swirl pattern in this DSP, this card design came to mind immediately! Although it is cut from the center of the 12” x 12” piece of DSP, it was totally worth it!! 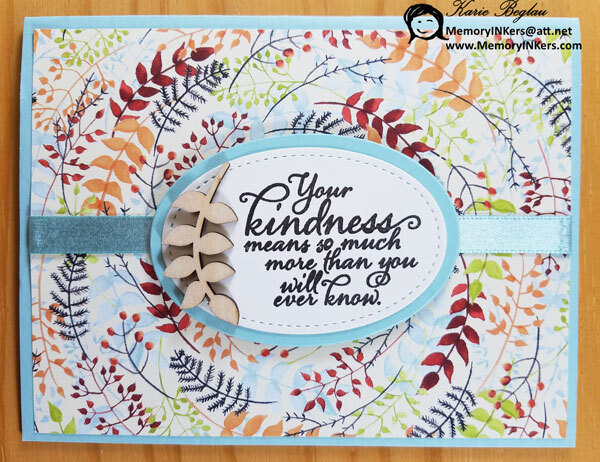 The base of this card and the sentiment matting is from Pool Party card stock. 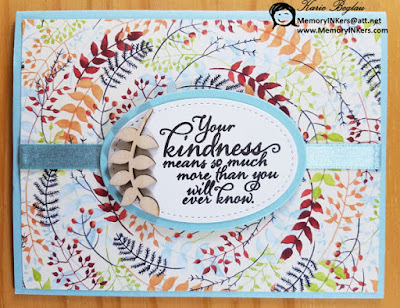 The sentiment itself is from the NEW Painted Harvest stamp set (you are going to LOVE this set!!) and is stamped in Early Espresso ink on Very Vanilla card stock. The fun wood leaf is from the NEW Touches of Nature Elements. I also used 3/8” Shimmer Ribbon in Pool Party. I hope you like to see more of my ideas you can follow me. Just use the one of the options in the upper right corner. 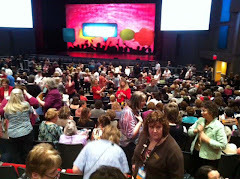 I hope you will enjoy hopping through the other blogs in our first hop! Click below to see what Judi has for you! You can view the information on products used in this post below the list of hoppers. 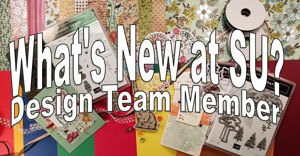 Order the products used in the above samples, and many other products, via my website www.kariebeglau.stampinup.net Today or on September 1st! Below are the product codes and prices for today’s projects. 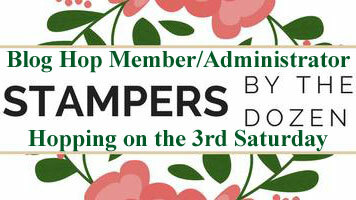 Labels: Blog Hop, Card Making, Christmas, Designer Series Paper, DIY, DSP, rubber stamp, Stampers Dozen, Stampin' Up!